Transmission problems can be a nightmare, but they don’t have to be. Coopers Auto Repair Specialists are here to take the headache out of transmission repair and maintenance. The transmission is a complex component within your vehicle. Because of its complexity, you need a specialist to help pinpoint and diagnose the problem quickly and efficiently. At Coopers, we have ASE Master Technicians that are ready to tackle any transmission repair you may need. We employ only the best technicians in the area. Not only are they highly trained and knowledgeable but they have the experience to identify problems more accurately. Whether you have an automatic, stick, foreign, domestic, or diesel vehicle our team can have you back out on the road in no time. Once you bring your vehicle in, one of our transmission repair specialists will conduct a multi-point inspection as well as an advanced diagnostic scan. Once the problem is identified, the specialists will go over your options and start the repairs as soon as possible. Our technicians are always happy to answer questions and explain the repair process. We want our customers to know what is going on with their vehicle not wonder. Providing great customer service is important to us and it shows in how we treat our customers. Being such a complex component many things can go wrong. Some of the more common signals are a burnt smell, discoloration of fluid, and loss of fluid. Regularly checking your transmission fluid is important and can help you catch a problem before it gets bad. Transmission fluid should be red and smell sweet. There are warning signs that can be felt while driving. If you are not getting enough power, rough or late shifting, or your gears are slipping you more than likely have a problem with your transmission. Another when driving is if you feel a shimmy when changing gears rather than a smooth shift you need to have your vehicle inspected. Automatic and Manual transmissions react differently when malfunctioning. Listening to your vehicle and how it sounds when running, stopped, and while shifting can help you diagnose problems. If you are able to catch these signs early, you can avoid costly repairs and untimely breakdowns. Concerning an automatic vehicle, you may hear a whine, buzz, or humming noise that it a signal that a repair may be necessary. In Regards to a manual, if you hear grinding when shifting or after fully engaging the clutch; you may have worn out your clutch or you an adjustment is required. If you are having any of the above problems, we suggest you have you transmission inspected immediately to avoid further damage. Coopers Auto Repair Specialists is your local dealership alternative with the best warranty in town. 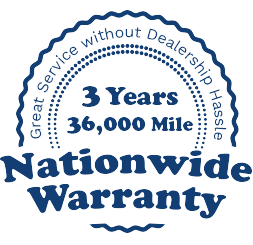 Every repair is backed by a 36 month / 36,000-mile warranty. For dependable transmission repair in Tacoma or transmission services in Puyallup, call or schedule service online.